Research4Life is central to our goal of achieving universal access to scientific, technical and medical research information. As a unique public-private partnership between UN agencies, universities, and publishers, it reduces the knowledge gap between developing and industrialized countries with free and low cost access to critical scientific research. Research4Life has five main programs – HINARI, AGORA, OARE, ARDI and GOALI – that provide research for free or at low cost to institutions in the developing world. The partnership's goal is to foster a strong and independent research culture in the developing world – one that is fully integrated into the international research community with sustainable economic development and enhanced quality of life. 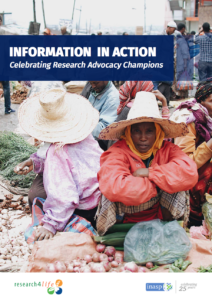 Since 2002, Research4Life have provided researchers at more than 8500 institutions in more than 115 low- and middle-income countries with free or low-cost online access to up to 85,000 leading journals and books in the fields of health, agriculture, environment, and applied science. As a founding partner, Elsevier contributes over a quarter of the nearly 85,000 peer reviewed resources in Research4Life, encompassing ScienceDirect and Scopus, including over 3,000 Elsevier journals and 20,000 e-books. In 2017, there were 2.4 million Research4Life article downloads from Elsevier’s ScienceDirect. We also provide technical and communications expertise to advance Research4Life, and have committed to the program through 2025. Elsevier also leads a communications taskforce of publishers and partners to boost the visibility of Research4Life. Projects have included a formal rebranding, films, bylined articles, panel discussions at science conferences, press releases, a website launch and research output press briefings. In addition to communications, colleagues throughout Elsevier are involved in Research4Life taskforces on access, authentication, metrics and training. Nazim Uddin, the Senior Manager at the Library and Information Services Section of the International Centre for Diarrhea Disease Research in Bangladesh. Dr. Uddin runs this modern and up-to-date library in the middle of a slum in the city. Research4Life is a public-private partnership of the WHO, FAO, UNEP, WIPO, ILO, Cornell and Yale Universities, the International Association of Scientific, Technical & Medical Publishers and more than 185 international scientific publishers. As an Assistant Librarian at Kyambogo University Library Services in Kampala, Uganda, Mary coordinates all ICT-related activities in the library. She also organizes and conducts training in Information literacy and digitization. 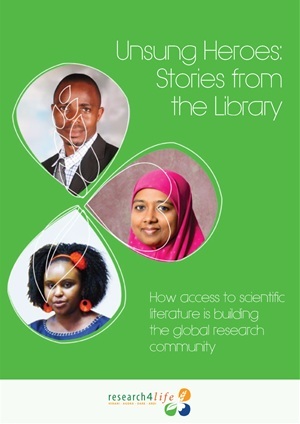 Through grants from the Elsevier Foundation, the Librarians without Borders program supports Research4Life trainers, promotes strong health sciences information capacity and assist librarians – through technological infrastructure and access to quality information. Researchers should thank librarians who help find their bibliographies. The work they perform is science without acknowledgement. - Dr. Sami Kambire, Burkina Faso. Thanks to Research4Life for providing digital access to evidence-based scientific information. It enabled flexibility of research ideas which would lead to solutions. - Alice Matimba, Zimbabwe.